The Jasper Mountain/Payne Hollow Loop lies in the northwestern corner of the Blue Mountain ecoregion. 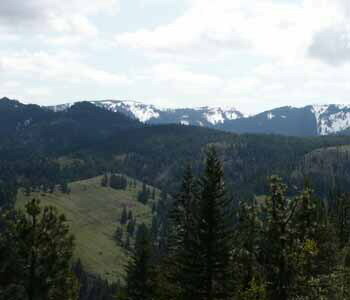 It includes a variety of habitats - cultivated fields, riparian areas, grasslands, and mixed conifer forest. A bluebird trail begins 4.6 miles from the turnoff onto Jasper Mountain Road. This trail continues for approximately three miles. Nesting bluebirds, Tree Swallows, Cassinâ? ?s Finches, and Chipping Sparrows can be seen along this stretch. Once into the conifers, look for woodpeckers, jays, nuthatches, and chickadees. Pileated Woodpeckers nest here, and recently Pygmy Nuthatches were found in the area. A good place to stop and walk is at the "T" before turning left to connect with Payne Hollow Road. Look for Chestnut-backed Chickadees and Brown Creepers here. Above 3,000 feet on Jasper Mountain, there is a possibility of seeing a Great Gray Owl. Merlins have also been seen at this altitude. There is a nice view of the Blue Mountains and the South Fork of the Touchet River drainage four miles after you turn left. The riparian habitat along Payne Hollow as you descend out of the forest is an excellent place to find Orange-crowned Warblers, Nashville Warblers, and other neotropical species. From the water tanks on the east side of Walla Walla, travel 13 miles east on Route 12 to McCowan Road. Turn right onto McCowan and continue for one mile to a "Y" intersection. At this point, veer right onto Jasper Mountain Road (a.k.a. Wilson Creek Road). In 9.2 miles from the intersection, you reach another "Y" intersection with a smaller road to the left. Stay on Jasper Mountain Road, and go straight ahead to a "T." Turn left on Mt. Pleasant Road. You are now heading in a northerly direction on what becomes, yes, Jasper Mountain Road. Continue north to Payne Hollow Road. Go left and follow Payne Hollow Road back to Route 12. It is 13.4 miles from the "T" to where the road connects with Route 12 west of Dayton, near the old Columbia schoolhouse and a Columbia County grain elevator. All roads on this loop are public, and you may stop and walk along any of these roads. However, all the land on both sides of the road is private property. Many areas are posted "No trespassing," but there are also some areas where access is allowed. Please respect the wishes of the landowners at all times.